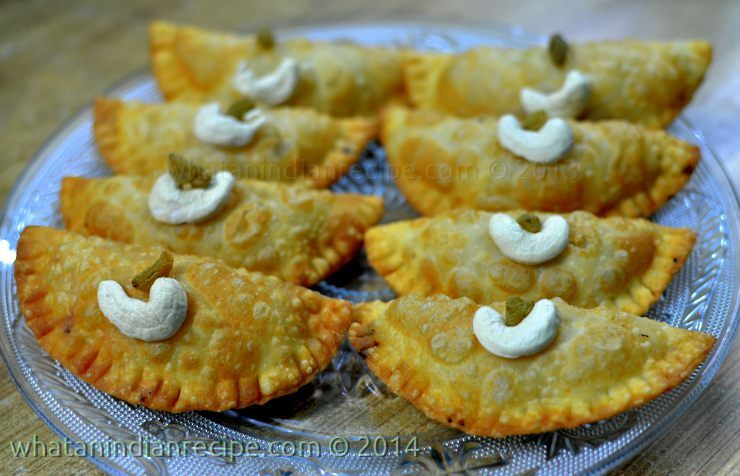 A sweet dumpling which has it’s origins in northern states of India, made of wheat flour stuffed with khoya & coconut. It is made usually during the festival of Holi. Mix all the ingredients except maida and oil. Next, make a soft dough of maida and salt with required water. Make small balls of the dough and then roll them out to small circles. Stuff the small circles if dough with the mawa mix and then fold the circle in half and seal the edges by pressing with a fork to seal and also make perforated design. Now deep fry them. Hot gujiya is ready to be served.